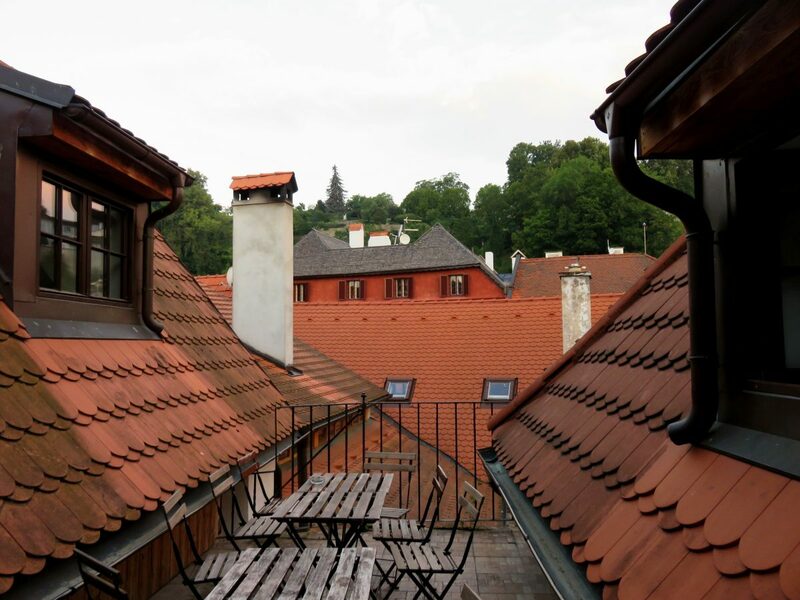 If you pick hostels solely based on their locations, it doesn’t get much better than the Travel Hostel in Český Krumlov. 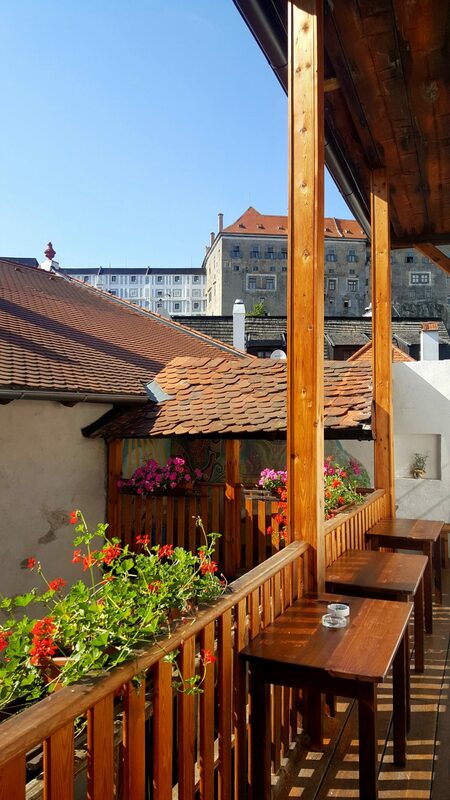 Located right in the heart of this picturesque town, the Travel Hostel is only minutes away on foot from the main square and the castle. 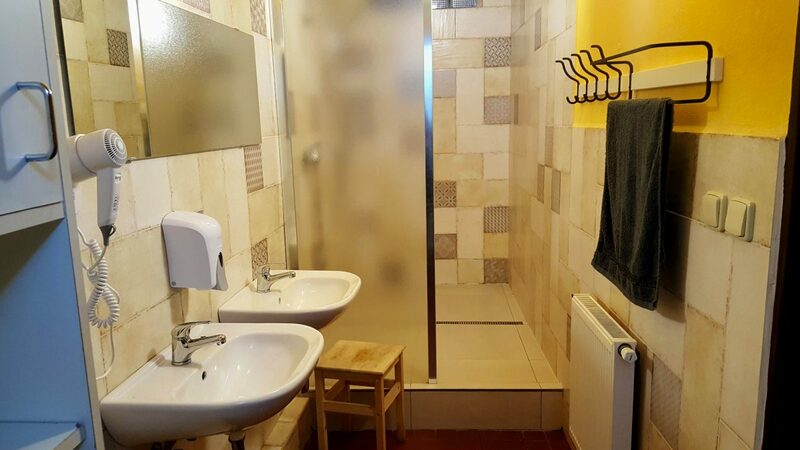 But there’s much more to this hostel than its fabulous location. Here is my review from my two-night stay at the Travel Hostel. 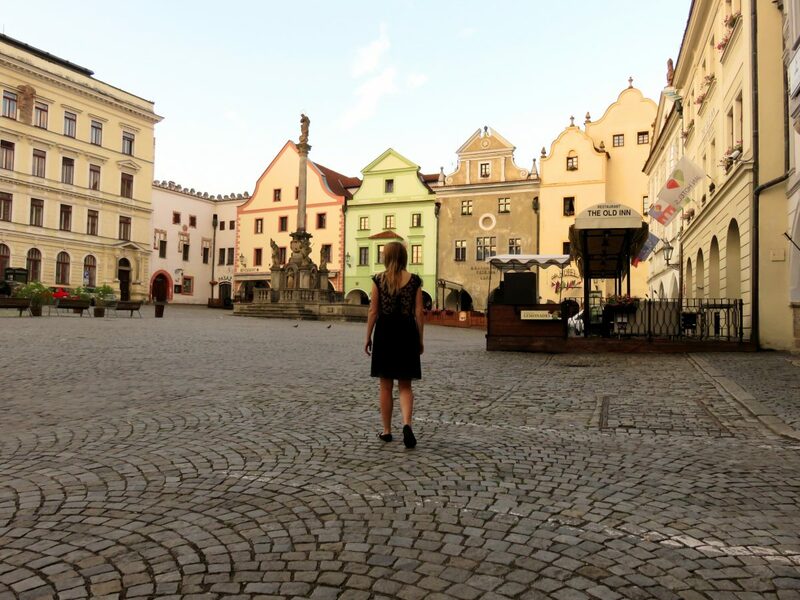 The building in which the Travel Hostel is located dates back to the 14th century! So the interior has a lot of wooden fittings and furniture which I adored. It gives the hostel warmth and authenticity. The hostel also has a couple of balconies with pretty great views. 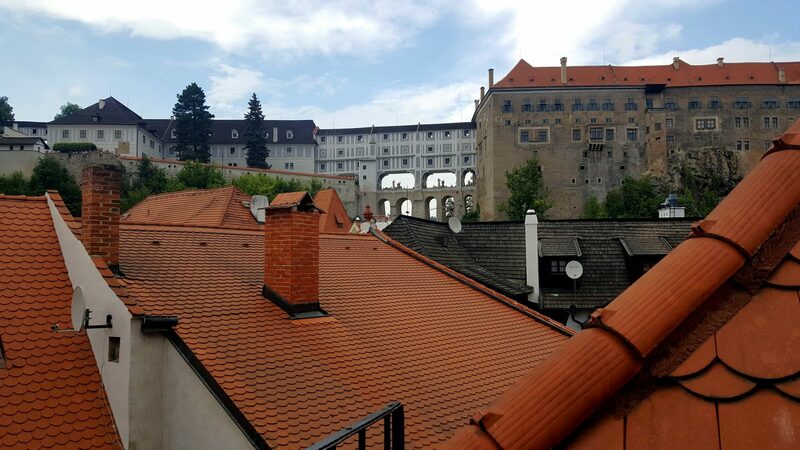 My favourite view is of the Cloak Bridge from the smoker’s balcony. 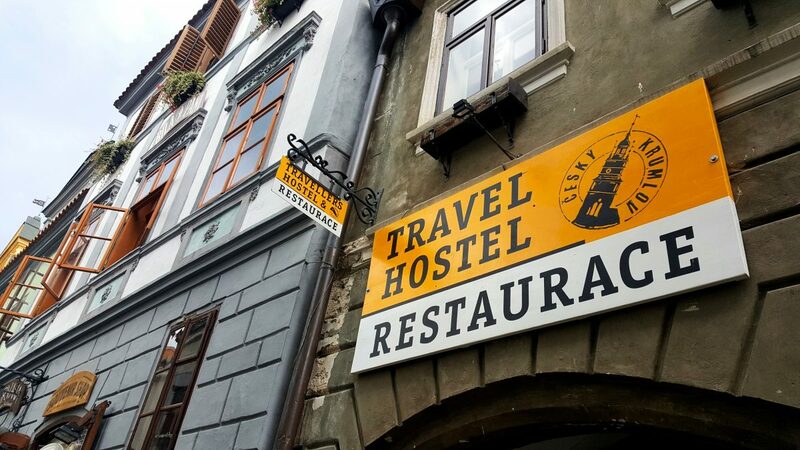 As a bonus, the Travel Hostel is located above a reasonably priced restaurant/tavern, which I think is worth checking out, although I never ate a meal there (because the vegetarian options were very limited). I booked a bed in a 4-bed female dorm room. I really liked the layout of the room because it felt as if every girl had her own space. 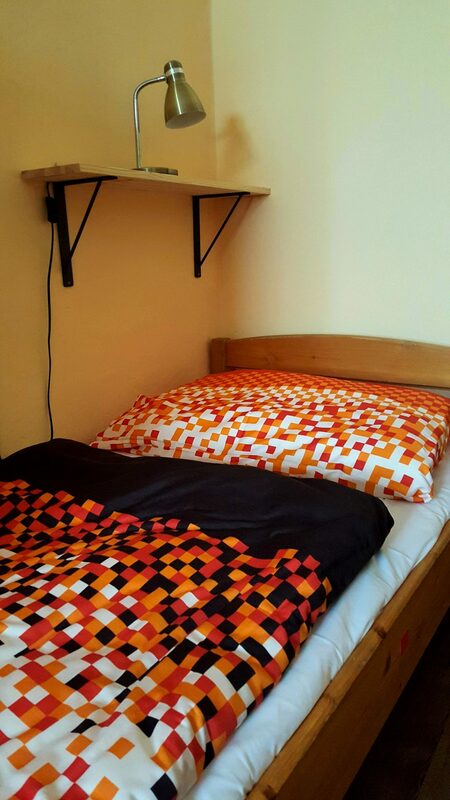 Each bed has a shelf where you can put things while you sleep like a cell phone or glasses. Each bed also had an individual lamp. And this I remember very clearly, the bed was super comfortable! On both nights, only three of the four beds were occupied, which meant even more space for everybody. I also really loved the lockers. You basically have your own cupboard where you can safely store your belongings. I’d say a small backpack or suitcase can easily fit inside, but there’s no space for larger suitcases, though. The only negative thing about the room for me is that it didn’t have air conditioning. It can get quite hot and humid during summer. To cool the room down, we had to sleep with the windows open. The bathrooms are completely separate from the dorm rooms and distributed along each floor. This worked out pretty good because I never had to wait to use the bathroom. And the most important thing, they were always clean! Breakfast is not included in your stay. 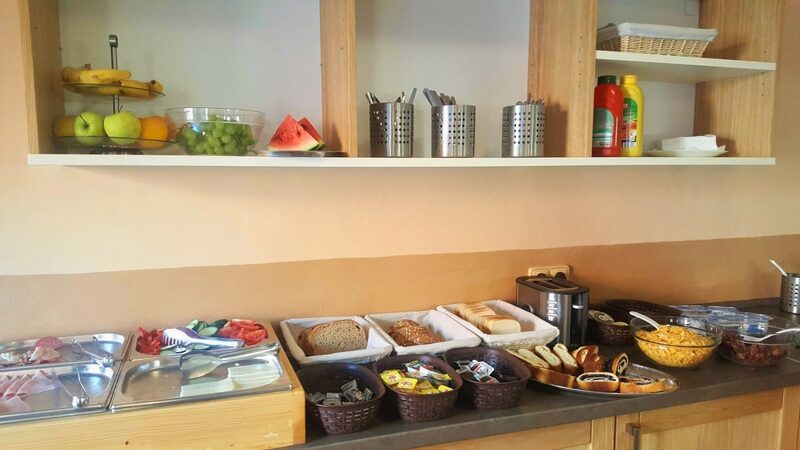 For a fee of €4, you can enjoy a tasty breakfast buffet at the hostel. You can expect to see scrambled eggs, sausages, bread and spreads, cucumber, tomatoes, bell peppers, cheese, and cold meats. The buffet also includes cereals, yogurt, sweet pastries, and fruit. Drinks include tea, coffee, and orange juice. The buffet is only served from 08h30 to 10h00, which is kinda late. But it worked out great for me because I got up really early to take photos. By the time I got back to the hostel, I had the buffet waiting for me. Do I recommend the hostel breakfast? Sure. I don’t know about you, but if I start my day with a big breakfast, it can keep me going for the whole day. What I liked about the breakfast is the convenience and the food was good too. 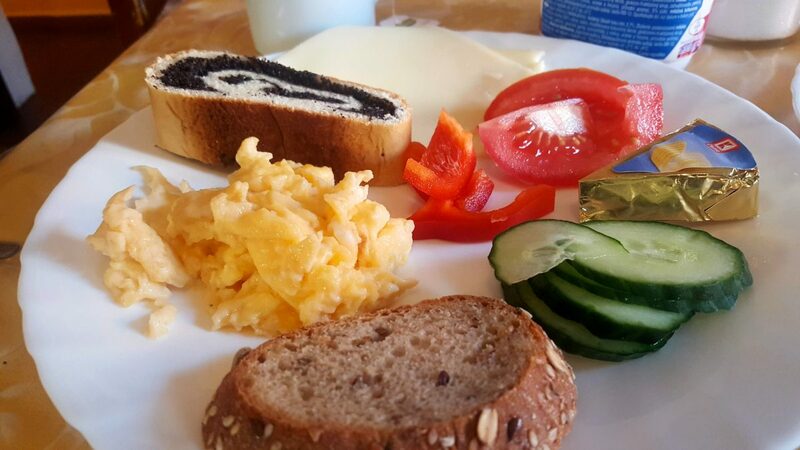 Just don’t expect a huge hotel breakfast buffet with a lot of variety and you’ll be fine. Alternatively, you can prepare your own food in the kitchen or eat breakfast at a café or restaurant. I really enjoyed my stay at the Travel Hostel. 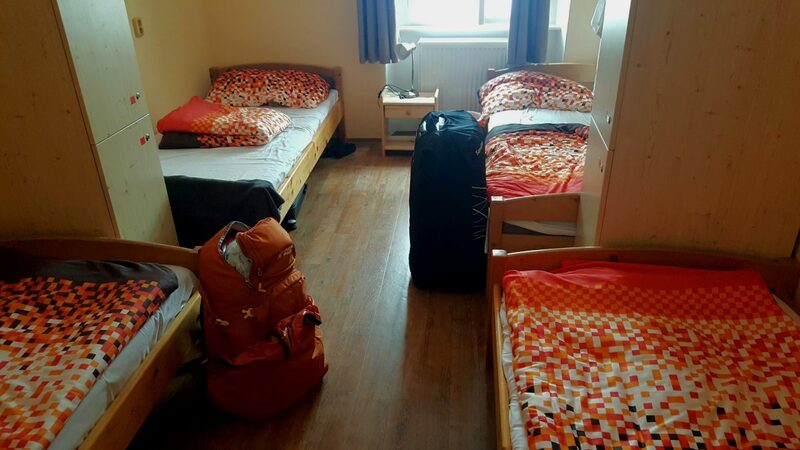 At a rate of only €16 a night in a 4-bed female dorm room during peak season, it’s a steal. The WiFi is reliable and the kitchen is huge if you wanna prepare your own meals. The reception staff members were very friendly and helpful, but the breakfast ladies, not so much. I mean, they weren’t unfriendly, but they weren’t exactly welcoming either. But grumpy breakfast ladies and a lack of air conditioning aside, I’d definitely recommend this hostel to my friends and family. I booked my stay at the Travel Hostel through Booking.com.